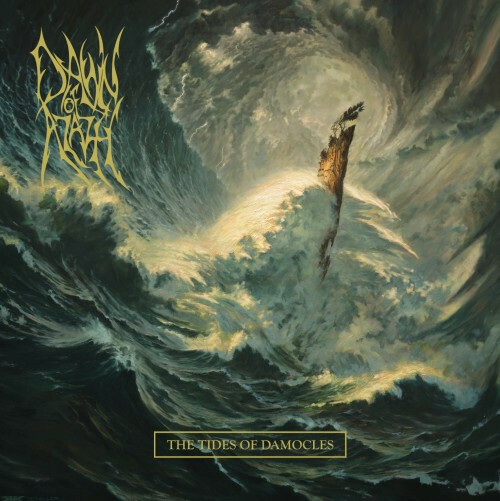 A couple of weeks ago, long-running New Zealand death metal titan Dawn of Azazel released The Tides of Damocles, the band’s first album in six long years. Formed in 1999, Dawn of Azazel are a crucial band in the history of New Zealand extreme metal. Their 2003 full-length debut, The Law of the Strong, is a 100% blistering and battering classic. And, over the years, Dawn of Azazelhave toured the globe, reaped acclaim from all corners of the metal underground, and received high praise in the press at home and abroad.In 2009, after the release and touring for Dawn of Azazel’s third album, Relentless, the band went into hiatus. Frontman Rigel Walshe wanted to further explore career options outside of the music sphere at the time. And it’d be fair to say the return of Dawn of Azazelin 2015 has been greeted with rapturous applause both at home and offshore.The band headed back to Mana Recording Studios last year to record, mix and master The Tides of Damocles, and there’s no question that Dawn of Azazel have returned with a ferociously aggressive, dynamic, and wholly skull-cleaving album. 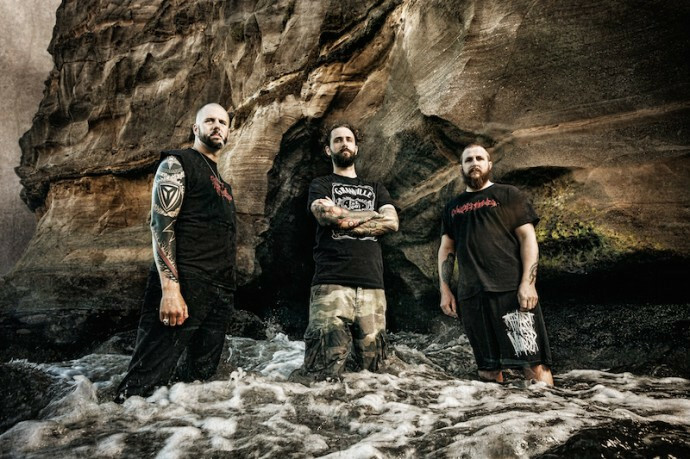 No Clean Singing caught up with frontman Rigel recently to talk about the band resurfacing, his reflections on his time away from the metal underground, and what the future holds for one of death metal’s premier cult bands. Let me take you right back, was there a particular album or a band that really made you want to pick up an instrument and play heavy metal in the first place? Probably Master of Puppets, that was the first metal album I had and it totally changed my world. An amazing album and completely unlike anything I had ever heard before. You took a chunk of time off from the metal scene to explore your career options a few years ago. But was there ever a moment in time when you thought seriously about not returning to the metal scene at all? Or is that artistic drive something that’s always lurking there for you –– whether you’re writing, touring, or recording, or not? I definitely felt at one point that I’d had enough of it — just musicians, industry types, the superficial and two-faced nature of it all. To be honest, I think that was largely my fault for making the band such a big part of my identity and self-esteem. I love it and it will always be something that’s important to me, but I think getting out of that headspace and getting a little perspective was something that was immensely beneficial also. I’d always had an artistic outlet from my early teens, so it wasn’t until I took a break that I realised just how important it is. It’s like oxygen, when you have it you don’t really notice how much you need it, but when it’s gone it’s very, very apparent why you throw all that money, time, and sanity away. I’ve done enough of the bucket list stuff, and if I didn’t feel that strongly about writing and touring for its own sake there’s certainly no way I would have come back. Did you ever stop and think about fans’ expectations surrounding the band’s return with Tides of Damocles? Did you ever feel nervous about being rusty at all? Or perhaps feel any pressure with having to deliver something wholly decimating after those years away? We definitely needed to make sure it was worth the wait in my opinion. I guess the hardest part was that as a band you begin to develop an identity from your previous releases, the fanbase you build and your experiences on the road and how they contrast with your musical peers. After our break it really did feel like starting from scratch, and figuring out just what we meant in 2013/2014 was something that took time. However, for similar reasons to those I alluded to in the previous question, I think getting the perspective that comes from taking some time out made it a very worthwhile exercise. You returned to the US to record Tides of Damocles at the famed Mana Studios. There’s been plenty of great metal albums recorded in NZ, so what, from your perspective, did the band gain from travelling so far from home to record the new album? I don’t know anyone here I’d trust with a project like this. Brian [Elliott] is an excellent engineer and producer and we trust his judgement. He’s definitely the sort of guy that when your perspective gets a little clouded after hours of tracking you can trust his call on whether a take was good enough or not. That’s a must-have in my books. He always has great input and a pretty good take on what the albums he has recorded are about inside and out. That collaboration is invaluable and central to our ethos of how an album should be done. Apart from that, getting out of your personal clutter in a foreign country, not coming home to your house, your room, and your mental and physical baggage is a great thing for creativity and inspiration. Lastly, we love Florida and have some good friends in the Tampa/St Pete area, so we love an excuse to travel and hang out there. Did you have the songs for the album sketched or fully mapped before you jumped on the plane to record in the US? How does the band compose songs in general? Yes this was the first time we did proper pre-prod with a ProTools rig. We had them all sketched out minus some of the vocals and lyrics due to the fact we ran right up to the day before leaving getting some of the rest done. Previously we just jammed out riffs individually at home, brought them to the practice room and jammed them out in a rather old-school fashion. On Tides and the new stuff we are working on, we record riffs to a click, share them via Dropbox, then jam them out and eventually demo the whole thing. We’re all pretty against moving into the realm of using clicks and backing tracks live, but using them for writing and recording does make a very expensive job exponentially easier and cheaper. How does Nick Keller’s fantastic cover art for Tides of Damocles tie into the album’s wider themes? I’m guessing that imagery of perilous erosion plays a role? Yeah, basically the brief that I gave him was a combination of the songs “The Odious Tides” and “Damocles”, which also of course was the same way the album title was created. Basically “The Odious Tides” speaks about life being a never-ending progression of turmoil, conflict, and struggle until you take your last breath, using the ocean as a metaphor — swim or be swallowed really. “Damocles” of course refers to the figure in the moral anecdote the sword of Damocles — power, success, and victory are tarnished with the anxiety and paranoia of ever-present ruin. He captured that perfectly really, rock worn away and frail yet resilient and persisting against the eternal violence and unrelenting energy of the tides, with a slightly psychedelic twist. International media coverage of NZ metal has increased significantly in the past few years. Does that give you hope for Tides of Damocles attracting attention from far and wide more easily? Or do you still see New Zealand’s isolation as a significant hurdle to overcome? Even for a band as well-travelled internationally as Dawn of Azazel? It’s good and bad. Piercing through the white noise from the sheer amount of content that’s out there these days is hard, no doubt. The music industry is in a state of flux so it’s difficult to say just how well it will work out, given that we opted for a self-release and word of mouth, and therefore personal contact and connection seem to be the most powerful promotional tools these days. Isolation is therefore still a major issue, it’s just a matter of how well people get your message from the tools you have to present it to them. I’ve always found that we get lumped in with genres that I don’t believe we have anything to do with, recently progressive death metal and deathcore on this one, so to me it just really depends on not being written off as part of any of these movements and listened to in that context, but instead as doing our own thing. We’ve been doing our best to avoid classification for 15 years now and seeing us compared to bands that I don’t see any real affinity with or connection to is still my biggest frustration. Given that Dawn of Azazel played an important role in the development and promotion of NZ extreme metal as a whole, how do you see the NZ metal scene nowadays? The scene’s certainly not without its share of ructions, but is it something to be proud of overall? Thanks. Yes I think so, definitely nowhere near as cohesive, driven, or passionate overall as say 2001-2005, which in my opinion are the glory days, but we definitely punch far, far above our weight per capita, especially when you consider how geography can make this exponentially more difficult in some ways. You’ve chosen to release Tides of Damocles on CD and digitally yourselves. But Dawn of Azazel has had no issue with attracting label interest in the past. What drove you to make that decision to go fully independent this time round? We had offers, we just didn’t really see that these parties had much to offer beyond what we could do ourselves without much expense. We used the same PR companies, for example, that we would have had if this had been released on Metal Blade, Relapse, or Unique Leader, yet we retain full control of the music, and more importantly the analytics and information that can be obtained in the digital age about who actually listens to your music, which I believe is invaluable. We may well look at inking some sort of deal in the future, but I don’t see any real value in handing away control to someone who is less than fully passionate about what you do and who does not really understand what you are trying to do with your music. Back at the beginning of these questions, I asked about your initial influences. Are they as relevant today as they ever were? Or has your personal growth over Dawn of Azazel’s storied career seen you reassess what music and art mean to you in this day and age? Yes and no. At this stage of the game we are more about looking inwards rather than outwards for inspiration. That in itself means to me they are just as relevant, but most people aren’t going to be able to see the connection between them and what we might release today. In my mind that’s the real beauty of it. With Dawn of Azazel now fully reawakened and re-energised, what are your plans for the future of the band? We are already well into writing the next one and looking at a few options for Australia and the northern hemisphere beyond what has been announced already. Nothing set in stone yet, but believe me we will make it happen! The Tides Of Damocles is out now via the official DAWN OF AZAZEL BandCamp page (linked below) and is available both digitally and as a six-panel digipack with 20-page booklet.